On August 28, a klatch of high-level representatives of some of the most anti-union groups in the country gathered on a stage at the Heritage Foundation in Washington, DC. They had come together, on the eve of Labor Day, to discuss a new scheme for dismantling workers’ rights: turning one of the most potent weapons in the anti-labor arsenal—so-called right-to-work laws (RTW)—on cities and counties. “The possibilities of rolling out a local RTW [campaign] in a non-RTW state deserves a full-court press by those of us who care about free market economics and allowing communities to make the best decisions for their people,” declared Jon Russell, a baby-faced partisan of the right who was sandwiched between Andrew Kloster of the Heritage Foundation and Patrick Gleason of Americans for Tax Reform. Flanking them were James Sherk, also of the Heritage Foundation, and William Messenger, the attorney from the National Right to Work Legal Defense Foundation who argued Harris v. Quinn last year before the Supreme Court. Russell is director of the American City County Exchange (ACCE), a new offshoot of the American Legislative Exchange Council (ALEC), which seeks to replicate ALEC’s state-level successes at the local level. As such, he is well poised to help mobilize, and coordinate, any efforts to bring right-to-work laws to the local level. “Our parent organization, ALEC, has model policy on RTW for the states. It’s very plausible we could see model policy available for local governments in non-RTW states,” Russell explained. No doubt, the notion of crafting model policies will be part of the conversation on December 4, during ACCE’s winter meeting, where local right-to-work will be one of only two labor proposals being discussed. The option of passing right-to-work laws at the state level was granted by Congress in 1947 in the Taft-Hartley Act, which CIO president Philip Murray described as “conceived in sin,” and President Truman denounced as a “slave labor bill.” In the decades since, organizations such as the National Right to Work Committee have put enormous resources into pushing state right-to-work laws across the country. Their reasoning is straightforward: right-to-work laws offer a way to defund labor from the inside by permitting workers not to pay unions for the cost of representing them, even though these workers are benefiting from the representation. They are the equivalent of allowing people to choose to pay or not pay taxes for the services provided by a democratically elected government. Since Taft-Hartley was passed, business and anti-union groups have successfully pushed for right-to-work laws in twenty-four states, and have tried numerous times to pass a national-right-to-work law. But they have generally avoided pursuing them at the local level, since there is nothing in the law that would seem to allow the approach. Now, however, some of labor’s leading antagonists have begun floating the idea, threatening to use what they are calling an “ambiguity” in the law to bring the right-to-work fight to some of the last, labor-friendly outposts in the country. Their goal seems to be to create beachheads in non-right-to-work states, such as Illinois, Ohio, or even New York, where the practice could spread and flourish. Whether the idea has any legal standing, or whether it’s simply being promoted to halt progressive momentum on the local level, its boosters have racked up enough past success that workers and labor-rights advocates should be concerned. In the paper, which is titled “Local Governments Can Increase Job Growth and Choices by Passing Right-to-Work Laws,” the authors extol what they consider the virtue of right-to-work laws, most notably their ability to undermine unions. They argue that right-to-work laws have effectively diminished unions’ size, power, and funding, and that such laws “reduce the aggressiveness of union organizers. They point to a study that “on average, union organizing falls 50 percent within five years of enacting a RTW law.” As an added bonus, the two assert that right-to-work laws attract businesses, though they have trouble explaining why this is the case if, as they suggest, these laws don’t lead to lower wages. They settle on the idea of freedom and entrepreneurial integrity, making it seem as if companies want nothing more than to pay their workers well and free them from the coercive power of unions. In doing so, they use an argument that was developed and refined by the National Right to Work Committee: that employers and employees have a natural alliance, and their common enemy is the union. Beyond these arguments, the authors dedicate a fair amount of attention to the legal question of whether local right-to-work laws are viable—a discussion that was echoed during the panel two days later. The courts have long held that when Congress passed the NLRA in 1935, it intended to create a unified national labor law. However, in the Taft-Hartley Act, Congress created a narrow exception with regard to right-to-work laws, allowing only a “State or Territory” to pass such laws. The essence of Sherk and Kloster’s legal argument, as well as their co-panelists’, is that the phrase “State or Territory” is ambiguous as to cities, towns and counties, making these prime targets for right-to-work ordinances. However, even as Liebman explained how there was little room to find the ambiguity that Heritage and company were arguing for, she paused, considered the current conservative federal judiciary, and equivocated. “There may well be some judges in front of whom this argument will be persuasive,” she said. Though the idea only seems to have made its way to Washington, DC, in the late summer, it is already being discussed in a few states. Bruce Rauner, who just won the Illinois governor’s seat, campaigned on the idea of “right-to-work zones,” which his campaign website described as allowing “local communities to decide whether workers must join a union in order to get a job.” Rauner knows well that he would not be able to pass a state right-to-work law in Illinois, where Democrats have long controlled the state House and Senate, so he is effectively encouraging Illinois cities and towns to pass their own ordinances. Emil Totonchi, the General Counsel of Teamsters Local 705 in Chicago, believes that these so-called right-to-work zones would not ultimately pass legal muster; but, he acknowledged, the mere concept is worrisome. But that may be precisely the point. Liebman explained that fights over these laws’ legitimacy, let alone their existence could be a huge distraction and drain on resources for unions. Such a scenario may have already begun playing out in Kentucky, where the powerful Republican Senate President, Robert Stivers, sent a letter on September 8—a mere two weeks after the Heritage panel—to the state attorney general asking whether a county can pass a right-to-work ordinance. Louisville Metro County Councilman Ken Fleming took this cue and has been talking about introducing a Louisville right-to-work ordinance as either stand-alone legislation or as an amendment to the increased minimum-wage ordinance that is currently being debated. Democratic Councilwoman Attica Scott told The Nation that Fleming’s approach “appeared to be an early attempt to stall the minimum wage ordinance” by introducing a poison pill. She expressed doubt that this effort will go anywhere now, but felt it was the first step in a long process. Unfortunately, early polling in Louisville found approximately the same majority of people favored an increased minimum wage as a local right-to-work ordinance. Many workers rights advocates I spoke to in Louisville explained this result away as too many people taking the phrase “right-to-work” at face value, and not fully understanding that it is usually used to defund unions, depress wages, and make labor organizing more difficult. Though this explanation may be true, it does nothing to counter the vulnerability that may be exposed by this new push for local right-to-work legislation. 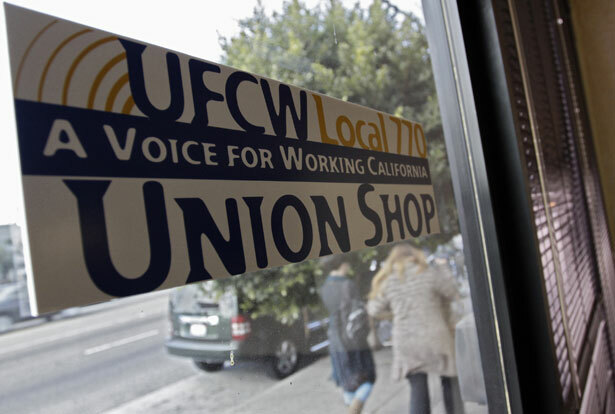 Whether it’s the message or the legislation’s content that appeals to voters, highly financed local referenda and carefully crafted public relations campaigns can lead to an even more difficult environment for labor organizing. However, even though there is no legal precedent for this proposal, and it seems to be based on a contrary reading of the law, one should be careful about dismissing this idea. The National Right to Work Legal Defense Foundation, which could provide some of the legal muscle for the push for local right-to-work, has had a lengthy string of cases that seemed like long shots when they began, only to have a conservative Supreme Court ultimately agree with them. And, indeed, several of the panelists at the Heritage seemed to relish the possibility that lawsuits might drive the issue up through the federal courts and on to the nation’s highest court. They recognized that the legal fight would be costly for cities, but seemed confident that one of various conservative legal organizations would pick up the tab. Until then, workers advocates may have to deal with another front on the war on workers.